There are many various types of fireplaces, and each one operates uniquely, has specific safety features, and particular costs associated with it. Keep reading to learn more about today's spotlight product: ventless fireplaces. 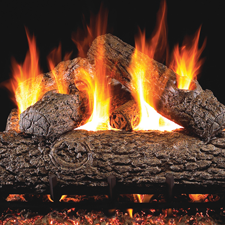 Also known as vent-free or unvented units, ventless indoor fireplaces are fueled by natural gas or propane. These fireplaces utilize gas pushed through a dispersing unit that allows flames to show through strategic gaps in artificial logs made of ceramic fiber. Each fireplace has a heat resistant box that has a control panel that runs the pilot line and a striker button. Unlike traditional fireplaces that vent smoke through a tube or chimney that goes outside, ventless gas fireplaces take in oxygen to help the fire burn and then return warm air into the room. Ventless fireplaces are safe because they burn such a low quantity of gas that the emissions produced are not hazardous. Most ventless gas fireplaces have a safety feature back up called the Oxygen Detection System. This gas detector is a feature that will turn off the ventless fireplace if the oxygen levels in a room drop below a limit that is safe. When looking to get a gas line put in for any gas fireplace, the price will depend on how much gas line will have to be placed in your home. The addition of a gas line can cost from $200 to $3000. With a gas stove, there is no need for ash removal or added chimney cleaning fees. It can cost $60 to $300 each year to clean a vent pipe on a wood burning stove. The cost of running a gas fireplace will depend on the area in which you live. You can calculate these costs by utilizing the following formula: (BTU rating X gas cost per Therm) / 100,000 = Cost of running your fireplace per hour Let’s use the Vent-free Empire Cast Iron Stove as an example. It utilizes an average of 27,000 BTUs per hour, and the current national average of gas is just under $0.87/therm. (27,000 BTUs X .87/ Therm)/100,000=$0.23/hour This means that to run the Vent-free Empire Cast Iron Stove in an area where gas costs are around the national average, it would cost approximately $0.23/hour to run this model of fireplace. Here at HVAC Direct, we offer a variety of different fireplaces. Here are a few of the vent-free models that we offer. You can view our entire vent free fireplace selection on our website. Summer is coming soon. Knowing a few steps to get ready before summer fully arrives will help you keep cool. Before you ever turn on your air conditioning, you need to make sure that the unit is clean and free of any debris. This will apply no matter what type of unit you have. If your air conditioner is a larger outdoor AC unit, you will want to make sure that no leaves or sticks have accumulated on or near it. If your AC unit is one that is removed and put into storage, you will want to make sure that nothing has dropped into it or gotten into where the fan spins. You will want to make sure that your ducts are clean if you have them, and that your filter has been changed or washed depending on the type of unit that you have. You will want to turn on your unit to make sure that everything is working correctly. Watch closely for any sparks or smoke and listen to ensure there are no strange or abnormal sounds coming from the air conditioner. If it makes a labored sound or has any smoke you may need a replacement or a repair. If you have the AC cleaned appropriately, all the filters are changed, and you have ascertained that the unit is working, you will need to leave it running for a while. After having the air conditioner on for 30 minutes to an hour, you should be able to tell if the unit is cooling the air. You will want to leave the AC on long enough to get a feeling if it needs to be looked at by a repairman to ensure that it can cool your home or room. You need to evaluate the area of your home and how much energy your AC is going to require for cooling. After looking at the BTU per hour (British Thermal Unit) VS wattage used by your machine, you can determine the costs of running this machine and if it is time to update or upgrade to a more energy efficient model. If you will be looking for a new air conditioner, there are some things you will want to consider when looking to get a new model. Do you need an AC and furnace combo? Will you be cooling your entire home with one unit? What is the area of the space you will be cooling? How much will the new units cost to run? If the unit face is seen inside, you will want to consider how it looks and if you like the way that it functions. Combination units that have both heating and cooling. Many different styles and sizes are available. Packaged Terminal Air Conditioners are units that contain heating and cooling units. You typically see these machines in hotels or hospitals. These units work by removing the heat from the air in your home. Have you considered buying a Mini Split system for you home but have been intimidated by their complexity? Mini Splits are a great option to cool and heat your home efficiently and it would be a terrible predicament for you to not utilize one for your home just because you are not sure how they work so I am here to help clear some things up for you. Since gas fireplaces are easy to maintain and burn clean, some homeowners presume that they don’t require an inspection. While it's true that they're low maintenance and efficient, it's also a fact that any appliance can become problematic if you neglect it. That's why we recommend a yearly inspection of your fireplace. Spring is finally here, and that means you need to be ready to give your wood stoves a good spring clean. Now that the weather is warming up, you won't need to use your fireplace as much making it the best time to give it a good cleanout. Here's how to clean your stove out to make it sparkle and ready for when you next need it. A condenser heat pump is an HVAC device that provides climate control in a building by facilitating the transfer of heat from one area to another. Condenser heat pumps are not active heat generators but rather heat conveyors that transfer heat from one location to another. There are all kinds of changes happening in home design right now, especially when it comes to fireplaces. Traditionally, homeowners primarily placed a fireplace in their home to keep it warm, but advances in heating and air conditioning are making this less essential. Should you still install one in your home? We believe you should. Take a look at some of the recent innovations that will show you that a fireplace is still valuable to your home's look and feel. 4 Reasons Why Boiler Systems are GREAT! First, we should know what a boiler does in an HVAC system. A boiler heats water sometimes to the point that it turns to steam and then pumps that hot liquid/gas through a piping system that runs throughout your house. These pipes will usually have heat dissipating fins located at key locations inside of floor registers that keep you from brushing up against it. This process of metal objects heating the air around it is called Radiant Heating. Fireplaces are one of the most in-demand amenities for many homeowners. While traditional wood-burning fireplaces are a classic addition to any home, with their homely ambiance and pleasant firewood aroma, these fireplaces tend to require a lot of maintenance and are not practical as you lose a significant amount of the generated heat through the chimney. When looking for a stove heating system, there's a lot to consider. You need to think about the looks, the value, and even the environmental impact. Recently, attitudes towards energy usage have changed, and millions of Americans are more conscious of their environmental impact than ever before. In fact, many consumers now consider the energy efficiency of their heating system the most important element, even above how good it looks.